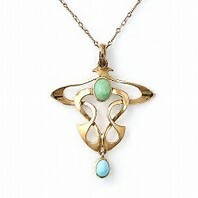 Art Nouveau (New Art) describes the style popular from the 1890's to the beginning of the First World War. It encompasses furniture, lighting, architecture, interior design, textiles, glass, ceramics, metal work and household items as well as jewellery. It was inspired by nature and involved curved and flowing lines based on plants and flowers. It was popular throughout Europe. 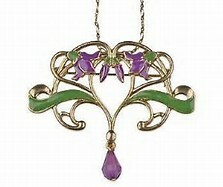 Art Nouveau took its name from the art gallery opened by Siegfried Bing, a Franco-German art dealer. It was opened in 1895 and called the Maison de L'Art Nouveau (House of the New Art). The floral designs of William Morris and the Arts and Craft Movement founded by his pupils provided the inspiration for this. 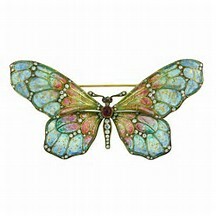 The jewellery of this period is instantly recognisable by its natural colours and shapes.